In eighteenth-century Japan, Tsunetomo Yamamoto created the Hagakure, a document that served as the basis for samurai warrior behavior. Its guiding principles greatly influenced the Japanese ruling class and shaped the underlying character of the Japanese psyche, from businessmen to soldiers. 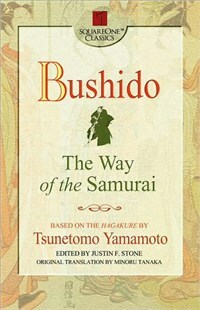 Bushido is the first English translation of this work. It provides a powerful message aimed at the mind and spirit of the samurai warrior. With Bushido, one can better put into perspective Japan’s historical path. Tsunetomo Yamamoto, a highly respected samurai warrior, renounced the world and retired to a hermitage in 1700. There, a disciple recorded Yamamoto’s thoughts on what it meant to be a Japanese warrior. His work, the Hagakure, served as the basis of Bushido.